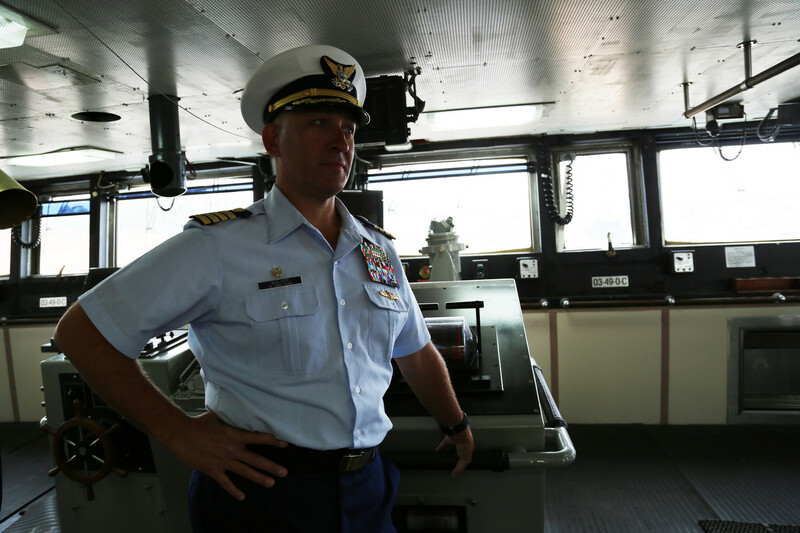 Captain Matt Walker took command of the Coast Guard cutter Polar Star, the only remaining active icebreaker in the U.S. fleet that's capable of clearing a channel for ships that supply McMurdo Station, a major hub for Antarctic research. This is Walker's second deployment on this icebreaker, which was commissioned in 1976 with a planned 30-year working life. I spoke with him aboard the ship as it was undergoing three months of extensive work in a Mare Island dry dock. So tell me about the Antarctica part. Polar Star's primary mission is to provide a channel for the logistics ships to resupply McMurdo Station, which really is a hub for all of the science stations in Antarctica. They take a fuel tanker down there and also a container ship. And McMurdo is kind of the port you might say - the logistics port - for all of Antarctica. It supplies the South Pole. But they do a tremendous amount of science support out of McMurdo and that's really what we do - is support science through our own means. We also have the capability to conduct science on-board. However, now that we're the only heavy icebreaker that can go to Antarctica for the U.S. the science is curtailed tremendously because we're too busy breaking in the channel to get the logistics ships into McMurdo. But as you can imagine, Antarctica is a pretty fascinating place with ice that's a million years old. They have opportunity to collect data from a million years ago. I tell the crew, when I took command, the Coast Guard does a lot of exciting missions -- law enforcement, search and rescue -- and there very good domestic opportunities for them and they have an impact domestically. But what we do on Polar Star, we might just be rescuing mankind by supporting the science that's being conducted in Antarctica that might just save the human race -- you never know. It's a long way and a hard way in. Give me a sense of what it's like to be on board. Well, to get to the ice we have to cross the Southern Ocean which is probably the most severe ocean on [sic] the world because there's no land mass to stop [high winds] and it has a series of low-pressure systems, so you get routinely knocked around pretty good. Ten years ago when I came down there we took green water, which is heavy water, up over the bridge and knocked out three bridge windows. The bridge windows are approximately 60 feet above the water line so you can imagine how big the seas were. Once we get down across the Southern Ocean, and we enter into the ice ring, then that's pretty light going. And it's not until we reach the fast ice, which means the ice is connected to shore, and then we have to turn that ice into ice cubes. So we're fairly large. When people ask, "How big is the Polar Star?" We tell them, "399 feet long," and then they think of that Navy destroyer that's 520 feet long. But in reality we're twice as large as a Navy destroyer by weight. We're close to 14,000 tons [fully loaded] and that enables us when we break ice to ride up on top of the ice and crush it. And that's how we break ice. But it's a very violent experience. If you can imagine the earthquake we had recently and experiencing that on every minute for a few hours as we crush through the ice, it's pretty violent. It sounds like it feels like an earthquake. It is, exactly. And you can't watch television. You can't read or anything, once the ship impacts the ice. Then we back down and then it's all smooth again. And then we ram back in and it gets very violent again. ...except our earthquakes last twenty seconds. Correct. The break-in might take a week. There's nobody more dependable than us to get there and make sure that we can get through the channel and get those supply ships in there. Because if they don't get that fuel ship and container ship, they really will have to shut down the science mission in Antarctica. You talked about the mission possibly saving mankind. What did you mean by that? Antarctica really is a giant laboratory for science in the world. And it really is -- I'll say -- sterile, as far as man's influence on it, meaning we haven't corrupted and contaminated that data that's available down there for them to collect. I'm not a scientist but I know that they bore down into the ice one, two miles, collect data that's close to a million years old and we haven't yet contaminated that, with the treaty that preserves that. So by us going down there, I like to think that we are allowing those scientists to conduct that work and that research that just might save the planet. And you've got sea lanes opening up where there weren't sea lanes before in the North Polar Seas. Yes, we do have the Healy up north which is a medium icebreaker. She is inadequate to go to Antarctica but she's adequate for the north because in the Arctic, the ice is only 6 years old at the oldest because it flows in a circular pattern and exits between Greenland and Iceland and through those channels out there so we don't need as heavy [of an] icebreaker but we do need the ability to put U.S. presence up there. From a Coast Guard standpoint, we're looking at it from maritime preservation, security, and for search and rescue. If somebody -- God forbid -- needs rescuing up there, who's going to go rescue them if we don't have icebreakers that can do that? I think the Healy's done a couple of search and rescue missions up there and just recently. And they also had to break into Nome to save Nome, Alaska. So we do need icebreakers. But people, you know, the United States -- other than Alaska and maybe the Great Lakes -- they don't see it. But we do have a presence there and we do have a responsibility to our maritime community to provide a safe and secure transit through the north and also up there we need to be able to fly the flag. Why is it, do you think, that you can't get the funding to give us the ships that we need in these parts of the world? Ice is pretty but it doesn't spend a lot of time on television and it doesn't capture the American audience's interest. We have a lot of things going on in the country, there's a lot of fiscal restraint, there's a lot of troubles in the world that are more on the forefront of the plate, of the burner than the Arctic and the Antarctic. Unfortunately those little hot spots come and go throughout history, but the Arctic and the Antarctic don't. They're always there. What did you say the sticker price would be on a new state-of-the-art heavy breaker? From what I have heard: a billion dollars. Now I could easily say, "Hey, the Air Force could not build one of their new fighter jets and we could have two or three of them!" But you wouldn't say that. No, I wouldn't, absolutely! But you know, it's all in perspective. The Coast Guard is a very small service. Arguably, we're smaller than the New York City Police Department. Our budget probably wouldn't buy the toilet paper for the Department of Defense, which is unfortunate and obviously I'm biased and would like to have more money for our humane mission. Yes, it is. Unfortunately, in the late 90s we had a young sailor that was standing on the port side of the bridge and we took a 35 degree roll. He slipped, fell and went sliding across the deck to the starboard side and was killed when he hit that stanchion there. A ship that is built optimized for breaking ice can't be the best in heavy seas. No, it is not, no. Yes, she does roll. 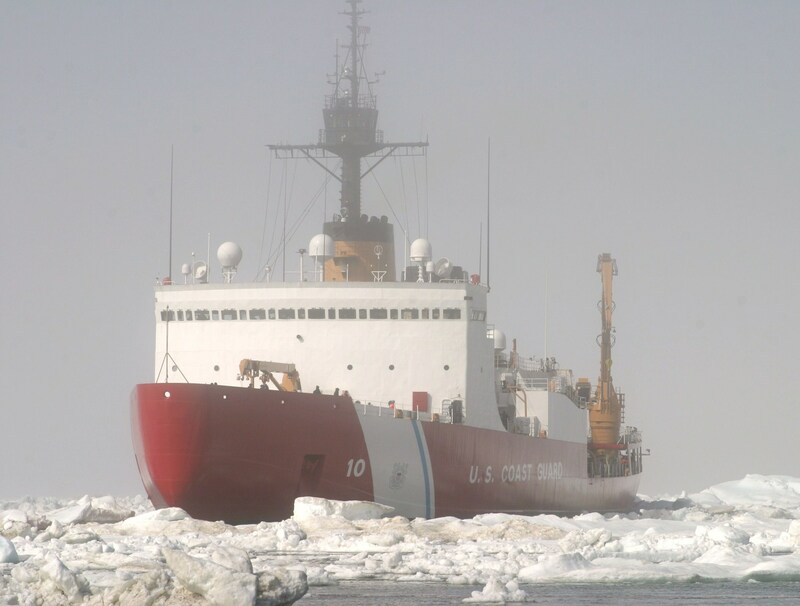 [Which is why, Walker says, they refer to icebreakers as "polar rollers."] I've often slept on the deck because it's hard to stay in my rack. So you keep a supply of Dramamine topped up? Well, this is proven. I've read this: One earplug in one ear -- you can tell this to all your listeners -- is more effective than all those other drugs. I read a study by one of the universities in the U.K., tested all these seasick medications and inadvertently discovered that the most effective one was one earplug in one ear. It doesn't matter which ear. Just one ear plug. I've seen it work. It worked on my wife. My wife -- if she looks at water she gets seasick -- went out a friend's yacht and she didn't get seasick at all. And on our way down here I was telling the crew members and several of them that are prone to seasickness tried it and it was effective. That's from somebody with 20 years of sea service. KQED's Marissa Ortega-Welch looked into the "earplug" strategy and found some references to it. Contrary to Walker's method, some sources specify which ear (left ear if you're right-handed and vice versa). While there appears to be no established scientific rationale for it, many say it works. We'll be conducting "field tests" of our own.